Product #60789 | SKU 996355005 | 0.0 (no ratings yet) Thanks for your rating! 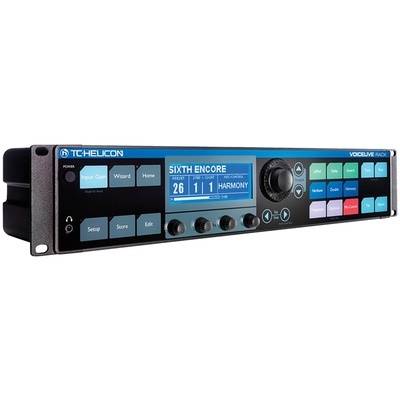 The TC-Helicon VoiceLive Rack Processor is a 2RU rackmountable professional voice effects processor designed for both studio and live applications. The unit features effects such as μMod (chorus; flange & detune), tap delay, reverb, harmony, doubling, and transducer (distortion and radio voices). It also comes with a dynamic microphone designed specifically for live vocalists, the MP-75. The effects processing system can produce a wide range of vocal sounds from many different styles of music throughout recording history. The voice processing signal chain starts with the included MP-75 dynamic microphone which features a neodymium magnet and significant off-axis rejection for close proximity feedback reduction and maximisation of available levels on stage. The signal processor can adjust tone, pitch correction, equalisation, compression, gating, and de-ess level to maintain dynamics under varying live conditions and help prevent the signal from becoming overly muddy in the bass. These adaptive processes can also be manually overridden by the user for customised control. The effect rack can harmonise the key and scale of the vocal signal with an input signal from a 1/4" guitar input, an 1/8" auxiliary input from a mixing console, a mobile device playing a .WAV or MP3 file, a preset key/scale, or input from a MIDI keyboard. The MIDI keyboard control can handle up to eight voices or four doubled harmony intervals. The microphone also features a built-in thumb button that can be used to trigger the vocal processor's digital effects. Effect combinations can be saved to the unit's 400 user preset slots. Alternatively you can select from the unit's 200 factory presets.